Community School sophomore point guard Taylor Adler, shooting here over Wood River’s point guard Austin Hafer (left), had an impressive game in Wednesday’s 47-27 Cutthroat loss to the Wolverines at a jam-packed Fish Tank in Sun Valley. Adler scored 8 points, after leading his team with 15 in a home loss to Dietrich Tuesday. One team comes from Hailey and one team comes from Sun Valley, but they seemed like crosstown rivals Wednesday night when the Wood River High School and Community School boys' varsity basketball teams clashed for the first time ever in a regular-season game. Enthusiastic fans packed the Fish Tank to the gills to watch the favored 4A Wood River boys use their depth to hold off the determined 1A Division 2 Cutthroats by a 47-27 score on the Sun Valley hardwoods. Ten different Wolverines scored points and the Hailey boys out-rebounded the Fish 40-27. It was a high-energy game on the court and in the stands. Trailing by 12 points in the second quarter, the Cutthroats cut their deficit to just five points midway through the third period but could draw no closer. The home team committed 9 turnovers in the second half, to just 3 for Wood River. Wood River senior Stone Sutton neutralized Cutthroat 6-6 senior post Henry Rickbeil and a slew of Hailey defenders (Dylan Carey, Austin Hafer, Colton Larkin) got into the face of leading Cutthroat scorer Will Brokaw (19.2 ppg) and held him to only a team-high 12 points. Sutton (12 rebounds, 2 steals, 4 assists, 7 blocked shots) finished with a game-high 14 points while his running mate, senior point guard Hafer, chipped in with 13 points, 4 rebounds and 3 assists. Other Wolverines were Quentin Dowdle (4 points), Pedro Contreras (3 points, 4 boards), Larkin (3 points, 2 steals), Ben Williams (2 points, 9 rebounds, 2 assists), James Petzke (2 points, 2 boards), Jake Vegwert (2 points, 3 rebounds), Connor Braatz (2 points) and Braxton Parish (2 points, 3 rebounds, 2 steals). Rickbeil (2 points, 8 boards, 5 blocks) was a force for the Cutthroats, but much of the Sun Valley energy came from sophomore point guard Taylor Adler (8 points, 5 rebounds, 2 assists). Adler was coming off a season-high 15 points in Tuesday's 66-31 home Northside Conference loss to Dietrich. Wood River (2-5) snapped a two-game losing streak and won on the road for the first time in two years. The Cutthroats (4-3) played at Camas County Thursday. In Wednesday's junior varsity game, Wood River's JV (1-4) earned its first win 57-12. Hailey scorers were Finn Isaacson 13 points, Max Mauldin 10, Gray David 10, Skylar Davie 7, Chase Hutchinson 6, Jose Hernandez 4, Zack Freeman 4, Eron Bates 2 and Kevin Hernandez 2. Fish point-getters were Jake Flaherty 6, Bobby Corker 4 and Ken Cheng 2. The Wood River High girls' basketball team (5-5, 2-2 league) enjoyed its best shooting night (60% from the field) and rallied past the host Filer Wildcats (7-6) by a 47-31 score Tuesday. The Wolverines outscored Filer 21-4 in the third period to gain a split of the season series. Assistant WRHS coach J.C. Nemecek said, "It was the best game as a team the girls have played this season." The Wolverine offense was potent in the paint—Haylee Thompson and Cheyenne Swanson shooting a 9-for-11 from the field. Contributors were Thompson (11 points, 3 rebounds, 3 blocks), Ciceley Peavey (10 points, 4 rebounds, 4 steals), Swanson (8 points, 2 steals, 2 assists), Hannah Belloli (a season-high 7 points, 2 boards, 3 steals), Haillie Taylor (5 points, 4 steals, 5 assists), Rory Cole (4 points, 6 rebounds) and Emmalie Dion (2 points). Wood River hosts Rigby Saturday, Jan. 7 at 3:30 p.m. Idle for nearly three weeks, the Carey School boys' basketball team (2-5) suffered through an ice-cold shooting night (26% field, 1-for-17 from 3-point range) on Tuesday night and dropped a 58-33 non-conference game to the 2A Valley Vikings (5-1) on the Hazelton floor. Valley outscored Carey 31-11 after intermission to sweep the season series. The Vikings shot 46% from the floor including 6-for-10 from 3-point range and out-rebounded Carey 34-24. 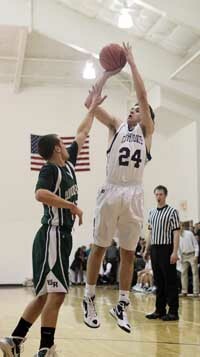 Leading Carey were Baley Barg (12 points, 9 rebounds, 2 steals) and Dillon Cenarrusa (8 points, 4 rebounds, 5 steals). Carey hosts Butte County today, Friday and the Challis Vikings Saturday at 6 p.m.